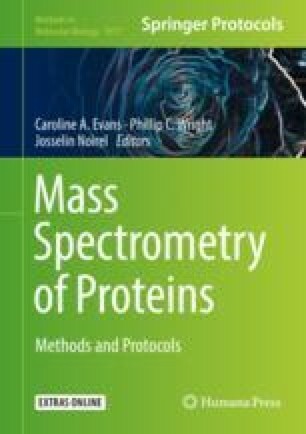 The technology of “sequential windowed acquisition of all theoretical fragment ion spectra,” known as SWATH-MS, is rapidly gaining popularity as a next generation proteomics technology for comprehensive proteome quantitation. In this chapter, we describe the use of SWATH-MS as a label-free quantitative technique in a proteomics study to identify novel serological biomarker for colorectal cancer. We compared the secreted glycoprotein profiles (glyco-secretomes) enriched from the colon adenocarcinoma cell line HCT-116 and its metastatic derivative, E1, and observed that laminin β-1 (LAMB1) was oversecreted in E1 cells. This novel oversecretion of LAMB1 was validated in colorectal cancer patient serum samples, and ROC analyses showed that LAMB1 performed better than carcinoembryonic antigen (CEA) as a clinical diagnostic biomarker for colorectal cancer. We focus here on the sample preparation methodology and data processing workflow for SWATH-MS studies. Q.L. acknowledges the support of a National University of Singapore research scholarship. The authors also acknowledge the funding from the National Medical Research Council, Singapore (NMRC grant 1217/2009).